The Christian Academy of Louisville will be holding a groundbreaking ceremony today, May 18th at 3:30 PM, to kickoff installation of a new, state-of-the-art athletic field from AstroTurf. The Golden Series DT field is a revolutionary product. Seeing it in person on our trip to California made a great impression on us all. This field will provide our students and visitors a high performing, safe surface for years to come. The Christian Academy of Louisville will be holding a groundbreaking ceremony today, May 18th at 3:30 PM, to kickoff installation of a new, state-of-the-art athletic field from AstroTurf®. The new playing surface at Centurion Stadium will be a cutting edge synthetic turf field that combines a sophisticated fiber system with a unique alternative infill. This innovative new AstroTurf Golden Series DT field will be the first of its kind in the state of Kentucky. The initial conception for this type of system was initially presented by Los Angeles Rec and Parks Department, and has since gained rapid ground across the state of California and is spreading to the rest of the country. What makes the AstroTurf Golden Series DT product so distinctive is that it synthesizes several different advanced artificial turf technologies into one cohesive system. It begins from the bottom up with a specialized Brock pad for maximum shock attenuation and stability. The artificial turf itself is a combination of high density slit film fibers for durability, and a specialized version of AstroTurf’s patented RootZone® system, which bolsters the turf for improved structural integrity. The turf system is incredibly difficult to manufacture correctly, as it is four times denser than most products on the market. The final piece is the infill, which is made up of sand and a unique product called ZeoFill, an organic mineral used in health food supplements and water filtration systems. ZeoFill absorbs (but does not require) water, and it slowly releases the water to create an evaporative cooling effect. All of these elements combine to deliver an exceptional playing surface engineered for high usage and consistent performance, all while eliminating the use of rubber. 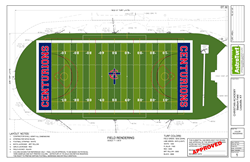 As the Christian Academy of Louisville began looking into an artificial turf field for Centurion Stadium, they were focused on demonstrating a commitment to excellence and player safety, as well as environmental sensitivity. The administration and athletic staff soon became interested in nontraditional systems without crumb rubber infill. After conducting extensive research, the school was interested in the AstroTurf Golden Series DT product. AstroTurf sent the CAL committee to Jesuit High School in the California to see just such a field, one that had been installed prior to the 2015 fall football season. “The Golden Series DT field is a revolutionary product. Seeing it in person on our trip to California made a great impression on us all. This field will provide our students and visitors a high performing, safe surface for years to come,” said Athletic Director Brad Morgan. “The groundbreaking is exciting for all of us who have been a part of this process,” said Steve French, Director of Facilities. “We think this new AstroTurf field is going to be an excellent surface for our students for years to come." Sports Construction Management, a Certified AstroTurf Partner, will install the new synthetic turf field. Their team will also be in charge of the literal groundbreaking as they handle excavation, site work and installation of the stone drainage base. The new surface that will replace the previous grass field will be lined for football, lacrosse and field hockey. For athletes and sport enthusiasts, AstroTurf has redefined the way the game is played. The company offers advanced, state-of-the-art, multi-sport and specialized synthetic turf systems with proprietary engineered technologies, leveraging the industry’s first vertically integrated manufacturing system. A growing number of high schools, colleges, professional sports teams and municipalities continue to select AstroTurf-branded products for their premium quality, technical superiority, and safety. To learn more, visit http://www.astroturf.com.